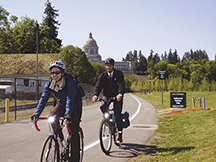 Two cyclists commute to work at the U.S. Federal Highway Administration?s Washington Division Office in Olympia, Washington. Photo courtesy U.S. Federal Highway Administration. Most of us in the U.S. commute in our cars, doing fairly routine things like steering, accelerating, and braking. We have a lot of brainpower to spare. By concentrating fully, and taking only a few white-knuckle risks, you can probably reduce your commute by 5% or so. That seems hardly worth it, when balanced against the increased risk of collision and injury. So what can you do instead? Commuting with one or two friends — people you enjoy — can be most rewarding. The opportunities for humor, fun, support, and compassion are endless. If you're concerned about getting "stuck" day after day with someone you've grown tired of, arrange it as a once-weekly or once-monthly gig, which gives you enough space between times to keep things fresh and interesting. And it lets you team up with other people too, on other days. Listening to audio recordings of professional books and training programs can convert your commute time from a black hole to a high point of your day. If you're learning new skills, and if the program is interesting and well done, you'll actually begin to look forward to your commute. Telephone conversations are best when you can give your partner in conversation your full attention. Listening to audio recordings as you commute is different — you can always pause the tape or backtrack if you need your full attention for the world around you. But you can't pause another person, so if your driving demands your attention, the person you're talking to feels your inattentiveness. High quality entertainment, especially humor, can be a valuable defense against traffic snarls and the worries of the job. Look for entertainment that captivates you. If your mind wanders to your worries, or the rude drivers around you, your entertainment isn't doing the job — find something else. If you think of something you want to jot down, speak it instead into a pocket tape recorder. It's much safer and more convenient than a note pad, especially if you're driving. Variety keeps you tuned in to the world around you. Vary your route, departure time, and transportation mode. If you usually drive, take the train once in a while if you can. If you usually take the fastest route, try a more scenic one. Would you like to see your comments posted here? rbrenkSQUGuZbRoEVDfyoner@ChacmDppcHiIXkNgZnXvoCanyon.comSend me your comments by email, or by Web form. Unless you execute all your action items immediately, they probably end up on your To-Do list. Since they're a source of stress, you'll feel better if you can find a way to avoid acquiring them. Having a Not-To-Do list reminds you that some things are really not your problem. I offer email and telephone coaching at both corporate and individual rates. Contact Rick for details at rbrenkFxHQMItbVlKzRNnner@ChacjOkZjLlUavMuKHDYoCanyon.com or (650) 787-6475, or toll-free in the continental US at (866) 378-5470.